To join the celebration, we present here the brain-related project "Nano-structured electroactive materials for electrodes in Central Nervous System (CNS) stimulation and repair", led by Prof. Nieves Casañ from ICMAB. Electrical stimulation may affect functional neural behavior, and may favor neural repair. Both aspects require biocompatible electrodes that prevent radical formation, protect the living system from the electric field effects, and have a large charge capacity. This project has allowed to create new hybrid electroactive materials formed by iridium oxide and graphene, with 100-fold increase in capacity versus the usual platinum found clinically for Parkinson/epilepsia/TOC diseases. These electrodes allow the application of direct fields for neural repair. Moreover, the graphene contributes with some very interesting properties to the electrodes: an increased stability and a larger charge capacity. Recent results prove that neural repair is possible in vitro, in very short stimulation times (40 min), and with direct field electrostimulation, controlling the charge delivered. Significantly, electric field effects are highly dependent on the electrode material used, and it is found that, over many materials tested, neural repair is optimal for iridium oxide-graphene hybrid electrodes. The type of materials used make the difference! The implications of these results suggest that this system may have an immediate use in safer electrostimulation procedures, and may open routes for much needed neural repair. Two American companies are already interested in electrostimulation and in this work, and a patent about the electrical stimulation has been filed. Currently, experiments are being performed in vivo in collaboration with the Faculty of Sciences and Medicine of the University of Valencia. This field of research, lead by Prof. Nieves Casañ, started in 2005, and has been going on since then with Spanish and European funding, and also received funding from "La Marató de TV3" (2012-2014). The Spanish "Plan Nacional" project entitled "Desarrollo de materiales electroactivos nanostructurados y recubrimientos: electrodos y estimulación eléctrica in vitro e in vivo" is the current funding source. In total, the research has been financed with 2.5 M€, and apart of the ICMAB, the Biomedical Research Institute of Barcelona, the Institute of Medical Sciences Aberdeen (United Kingdom) and the University of Valencia are also part of the consortium. 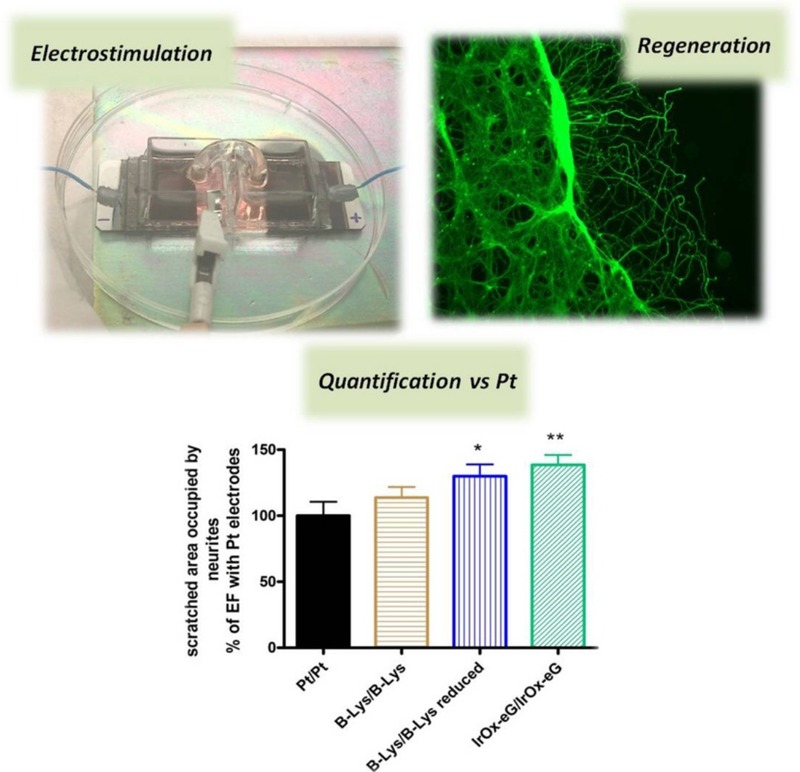 Short-term electrostimulation enhancing neural repair in vitro using large charge capacity nanostructured electrodes. M.P. Lichtenstein, E. Pérez, L. Ballesteros, C. Suñol, N. Casañ-Pastor. Applied Materials Today 2017, 6, 29–43. IrOx–carbon nanotube hybrids: a nanostructured material for electrodes with increased charge capacity in neural systems. N.M.Carretero, Mathieu P.Lichtenstein, Estela Pérez, Laura Cabana, Cristina Suñol, Nieves Casañ. Acta Biomaterialia 2014, 10 (10), 4548-4558. 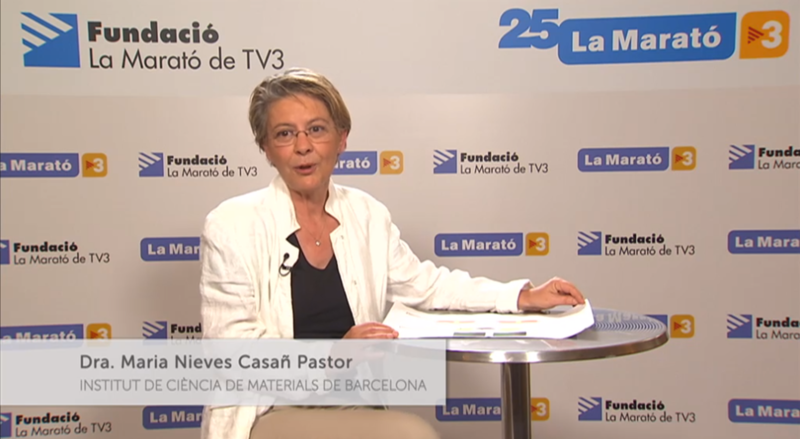 If you want to know about this research, don't miss this video from TV3, in which Prof. Nieves Casañ explains the results of the project obtained with funding from "La Marató de TV3". Click here to watch the video. The ICMAB wanted to join the celebration of the BAW by explaining two of the brain-related projects that our researchers work on: a project on "Nano-structured electroactive materials for electrodes in Central Nervous System (CNS) stimulation and repair", led by Prof. Nieves Casañ from ICMAB, and a project on "Magnetic biomaterials for brain repair and imaging after a stroke", led by Dr. Anna Rosell, from VHIR, and in which Prof. Anna Roig from ICMAB participates.